Western blot analysis of Jurkat cell lysate (lane 1 & 2) and rat kidney tissue lysate (lane 3) probed with Rabbit anti ILK1 antibody (AHP2319). 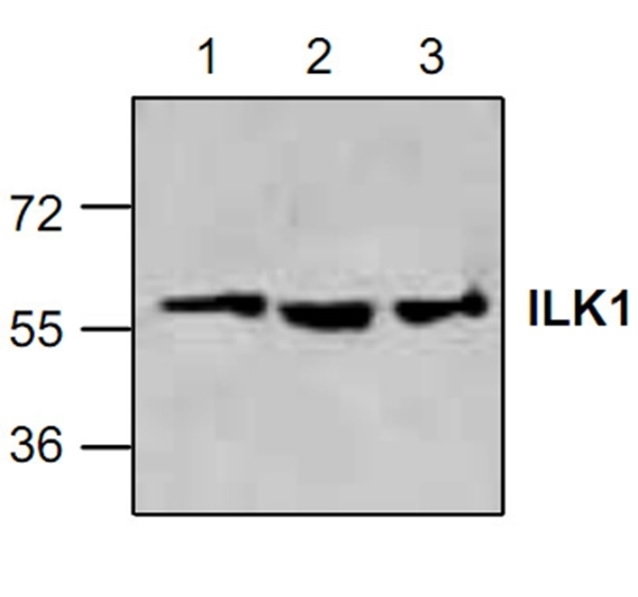 Rabbit anti ILK1 antibody recognizes ILK1 (integrin-linked protein kinase). The ILK1 kinase as the name implies is involved in the regulation of integrin mediated signaling. Known targets of the ILK kinase include AKT1, GSK3B and the beta-1 and beta-3 integrin subunits.